The French India had attracted steady stream of scholars, though the names of Aurobindo and Bharathiar are popular, still there remain many who have to come to light. The Ceylonese connections to Pondicherry and the scholars of Saiva Siddhantha who landed here in pursuit of knowledge is one field that has to be researched further. Srilanka was then known as Ceylon and from Jafna Pandit Thenkovai S.Kandiah Pillai landed in Pondicherry and edited a weekly on Saiva Siddhantha. “Vittagam” which means the mind of the seed brought out for 3 years from 30.11.1933 was priced “one Ana” which carried the title in French along with Tamil. Apart from the philosophical editorials, which formed a major part of the 8 page weekly publication, there is much news about the socio political situation of those times. The Assembly of French India known as Conseil General was inaugurated on 25.11.1933 around 4 PM in the Municipal buildings amidst huge attendance by people. The French Governor George Bourret in his inaugural speech lamented at the lack of adequate education to the children from 6 to 13 years and urged the members of the assembly to improve the infrastructure of school education. He expressed grave concern over the total neglect of Tamils in learning their mother tongue and in imparting education to their children in Tamil. George Bourret stressed that Tamil medium of instruction must be made compulsorily and higher education in Tamil must be improved. He felt that degrees should be conferred on students of Tamil medium on par with those who learn French. He also stressed the need to encourage private educational institutions. “ The foresight of the French Governor is laudable and his advice is applicable even for present days” opines Dr.Ira.Thirumurugan of Tamil Development Action Group, a private initiative of Tamil scholars in the Union Territory. After the French governor’s speech election to the new assembly members took place. Advocate Chellan Naicker was chosen President. Mr.Thiagaraja Pillai of Karaikal and Mr. Sadhu Charan Mukkerjee of Chandranagore were elected as Vice Presidents. Mr. Balasubramania Pillai, Advocate Perumal Naicker and Selvarasu Chettiar were chosen as Secretaries. Mr.Balasubramania Pillai, Mr. Thanaraja Pillai, Mr. Yubert de Rozario, Mr.Henry Gaeble, Mr. Gnanou Thiagou, Mr. Joseph Laporte, Mr. Ramachandra Naicker, Mr. Sambasivam Chettiar, Mr. Veera Pillai were chosen members of the Economic Committee. “ Vittagam” apart from detailing this historical event also places on record that a Report of the Commission on Colonies (Rapport de la commission coloniale) was tabled in the assembly by Mr. Joseph Laporte. This journal propagated the Thirumoolar School of Yoga. Thirumoolar it was believed lived for 3000 years and wrote one poem every year, which is called as “Thirumoolam” These treatises were focus of scholarly debate of those days when people felt that yoga is a way to gain longer life on earth. English bard Mathew Arnold wrote the poem Scholar gypsy in which he said gypsies possessed the knowledge to live beyond 200 or 300 years. Saint Vallalar believed that human body could transform into a body of light and vanish in the air and get lost in the vacuum. “Vittagam” and its writers were of the view that with the body they can attain divinity and stated that it was the True Attainment of Salvation. “ Unmai Mukhthi Nilai ” written by Pandit Thenkovai S.Kandiah Pillai expounds this theory in detail. The journal Vittagam went to India (British), Burma and Ceylon. The annual subscription was rupees 3, while for Malaya, Singapore and Saigon the annual rate was Rupees 4. A letter from a Teacher of Saint Johns College Jafna dated 18.1.1934 the reader S.G.Arulanandha said “ Your articles are very stimulating of thought and action. I am a fervent Christian and you are to me interpreting truly the life of my lord and Master Jesus.” In every week from the letters to the editor published it becomes clear that this magazine left a deep imprint in Ceylon, Tamil Nadu, Malaya, Saigon and Burma. The publisher of this philosophical weekly Mr.R.Nagaratnam was among the few nationalists who were with Aurobindo Ghosh in his initial years of the stay in Pondicherry. During the year 1923 the Inmates of Ashram as published by M.P.Pandit in the book “ Champaklal Treasures” are Rajangam, Tirupati, Khitish, Nolinda, Satyen, Kanai, Bejoy, Purani and Nagaratnam (a local devotee). Also in the picture are Punamchand, Champaben, Mrs.Kothandaraman, Mr.Kothandaraman, Champaklal, Moni, Amrita and Manmohan. 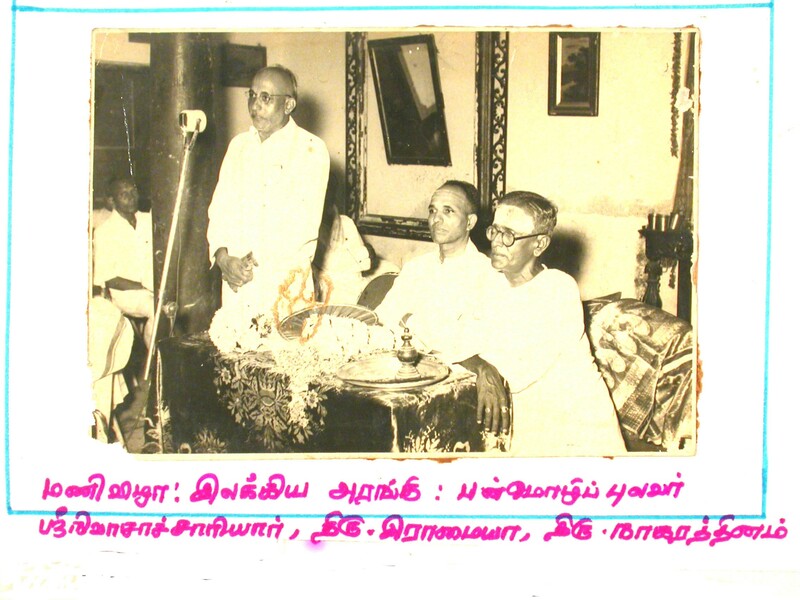 Late R.Nagaratnam Pillai born in 9.05.1899 and passed away on 26.11.1992 in his 93 rd year. The nationalist who went on secret missions to bring freedom fighters to Pondicherry and who offered asylum in his house was detained by the British Police at Tindivanam and was in prison for 15 days from 25.12.1925.He headed an agency R.Nagarathinam Pillai and Brother importing Austin and Ford Cars in French India. Also he was a Correspondent for Illustrated Weekly of India in French India and agent for Dinamani and Indian Express. Vittagam Press that brought out many books from its premises situated at2 & 4 Ambalathadum Iyer Madam Street. Those houses had been a place frequented by Mahakavi Bharathiar, Lalalajpat Rai, Chitaranjan Das, V.V.S.Iyer, Neelakanta Brahmachari, Suthanandha Bharathiar, Maraimalai Adigal and many scholars of Saiva Siddantha School.“The Saivite school and scholars of that ideology with various “siddhar peedams” around Pondicherry are fresh areas for further research” opines Dr.N.Sengamala Thayar, the daughter of R.Nagaratnam currently in charge of Bharathiar Museum at Pondicherry. Pondicherry University, a Central University established the Department of Tamil in 1986, and later upgraded to a School of Tamil. Yes, thus came the Subramania Bharathi School of Tamil Language and Literature. “This school had produced 60 scholars who have done their Ph.D’s and 28 are currently striving to become Doctors of Literature. 181 scholars obtained M.Phil degrees and currently 34 are studying. The research culminates in presentation of scholarly thesis” states Dean of the School Dr. A.Arivunambi. Dr.Arivunambi also functions as Acting Vice Chancellor during the absence of the regular Vice Chancellor. As the leading beacon of Tamil Development he states with pride that Pondicherry University is the first and only one to have got a grants for 5 years under Special Assistance Scheme from the University Grants Commission. This recent achievement gives impetus to draw plans for the development of Classical Tamil. “If you want to know about the Tamil computing researchers, www. tamilsoftware.biz lists out only 2 people from the Union territory of Pondicherry. They are Professor Kuppusamy, who heads the Computer Sciences Department of Pondicherry University and Prasanna Venkatesan, Lecturer of same faculty. At one faculty two researchers exist to give impetus for promoting Tamil in the world of web, and the other side we have a Tamil Department which had yet to avail this talent within the campus to equip Tamil scholars and students with adequate knowledge to handle computers and to elevate Tamil to the reach of netizens.” opined a Tamil scholar with anguish. There seems to be fresh plans for inter departmental coordination after such criticisms were aired in scholarly circles. The western experiments to open knowledge to one and all by creating Open Access Online Libraries, from where all scholarly research papers could be availed by anyone interested from any part of the globe is slowly spreading its influence over Tamil scholars.Tamil lovers of Pondicherry are keen to know the subjects of the research undertaken by various scholars in the Pondichery University. “The practice to upload all research materials into Internet is a must and web publishing must be given top priority so that what a researcher in Pondicherry University does becomes known to other researchers all over the world,” said C.P.Thirunavukkarasu, President of Anna Foundation. Though members of the faculty have brought out many books and students too have many books and articles to their credit, in these days of globalization, they have to market their achievements, publicize them and bring it to public notice. A report of the expert committee headed by Va.Suba.Maniccam Former Vice Chancellor of Madurai Kamaraj University had in the initial years suggested for creation of separate faculties for Tamil Studies, Linguistic Studies, Fine Arts and Overseas studies. It had mooted the suggestion that under the faculty of Tamil Studies departments of Tamil Literature, Cultural studies, Religious and Mythological Studies, Comparative literature and Indian folklore could be set up. The committee also had suggested separate department for Bharathiar and Bharathidasan Studies. 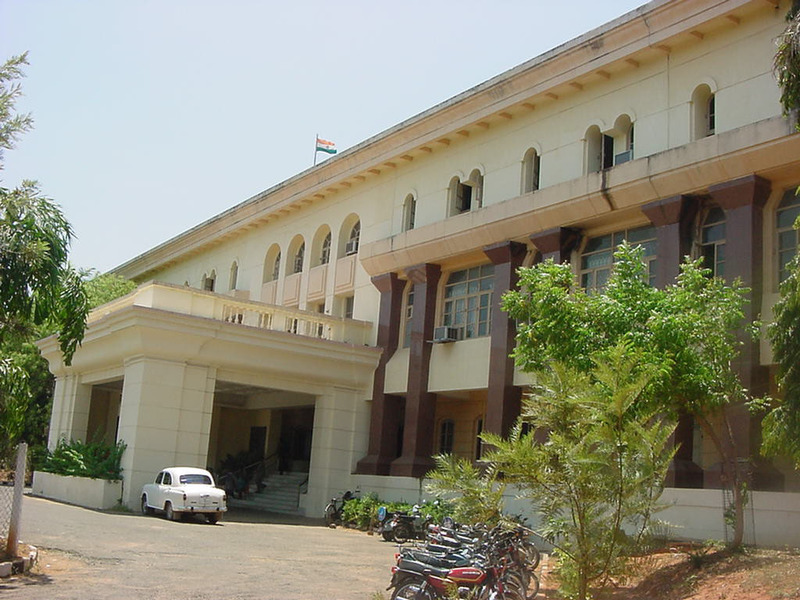 The Faculty of Linguistic Studies with separate departments of Indian Grammatical Studies, Linguistics, Translation, Dialectology and Tribal languages and The Faculty of Fine Arts with Department of Music, dance, Drama and Painting must have been set up, if the recommendations of the expert committee had been taken into consideration. Much time is lost and because these faculties and departments were not created in spite of the First Central university being started in a Tamil language speaking region. Dr.R.Kothandaraman of Tholkaapiyar Centre for Fundamental Research says that “ sixteen years had passed and lot of opportunities are lost. There is a need to review the expert committees suggestions and to have an update on its recommendations so that fresh initiatives to develop Tamil studies could be explored”. Incidentally he was one of the members of that Expert committee. Due to non allocation of funds where our representatives failed, all such new departments could not come up till 2007, the time when next five year plan launches. As a prelude for opening Departments of Modern Literature and Religious Literature, two new M.Phil courses have started , thanks to the initiatives of Dr.Ilamathi Janakiraman. This unique Central University must be made into a global meeting place for promoting Tamil as an international language with state-of-the-art technology to connect to the global Tamil community via the Information Highway feel the foreign scholars doing research in Tamil. 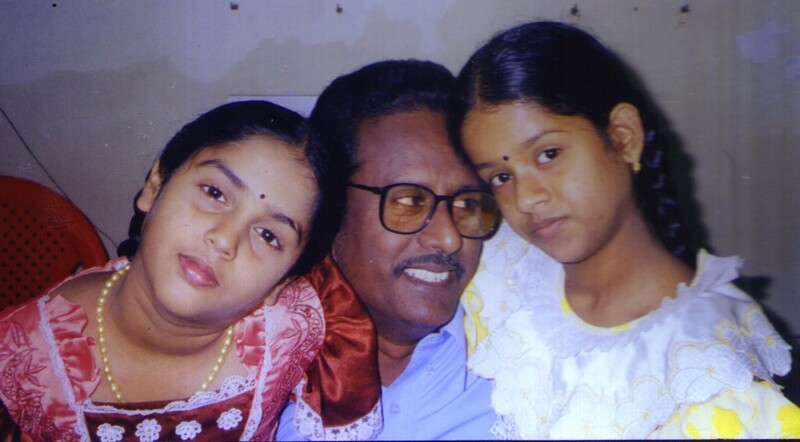 “To help Tamil communities living abroad to establish a digital network for promoting the study of Tamil language and literature, to establish a grid of learning so that Tamil communities worldwide may exchange Web-based resources, to develop and promote Tamil in electronic form to enable Tamil learners to experience the glory of Tamil language and culture, to promote a sense of Tamil identity both in nations having large Tamil populations and all former French colonies with which still sizeable Pondicherrians are culturally and professionally interlinked, Pondicherry University had lot to do” opines Mannar Mannan, President of Puthuvai Tamil Sangam. “These former French colonies have large population of Tamils who are on the verge of forgetting their mother tongues. Hence online courses to impart Tamil learning to geographically separate Tamil communities becomes the historical mission of Pondicherry University and it is time it reaches out to those who need its help” said Professor M.Lenin Thangappa. But all scholars are hoping that Subramania Bharathiar School of Tamil studies will surge ahead and scale great heights in glory, since the very name of the school will be a source of inspiration for all knowledgeable Tamils to pool their goodwill to make this School known internationally. Pondicherry is a melting pot of various linguistic groups and cultures. Therefore it is no surprise that lot of people from Orissa have found a haven in Pondicherry. Trailing them to study for his research papers R.Balakrishnan I.A.S, Chief Electoral Officer of Government of Orissa often visits Pondicherry. There is another dimension to his visits, which is to pay respects to his teacher Dr.Vijayavenugopal of Ecole Francaise D’Extreme Orient. Mr.Balakrishnan had presented numerous research papers and he specializes in toponymical probe. “Place names are fossilized representations of the past. In retracing the footprints of our ancestral migrations, place names can be our guiding stars. Our case in this regard is built on the foundation that the migrating people do carry their place names and reuse them in new found homeland as a mark of continuity with past.” says R.Balakrishnan explaining the rationale of the toponymical probe he had ventured into. In an article that appeared in the International Journal of Dravidian Linguistics, R.Balakrishnan throws “New lights on ancient contacts between Kalinga and Indonesia”. A study conducted by him revealed remarkable similarities between the place names of Java, Sumatra and Bali regions of Indonesia on one hand and the places of Southern Orissa on the other hand. The Chilka region of Orissa seems to have been the focal point of Kalingan interactions with South East Asia. Balakrishnan is serious in his research and had done extensive travel to remote regions to draw similarities of place names. In another research paper titled Tamil: A Toponymical Probe he had given a long list of place names that bear the “Tam” prefixes. In a state wise alphabetical list of Tam prefixed place names in India, he states that in Andhra Pradesh , Arunachal Pradesh , Assam , Bihar , Gujarat [5), Goa , Haryana , Himachal Pradesh , Karnataka , Maharastra , Meghalaya , Manipur , Madya Pradesh , Nagaland , Orissa , Punjab , Rajasthan , Tamil Nadu , Uttar Praseh , West Bengal  with a grand total of 612 places names resembling Tamil and Tamil influences do occur. This research may sound funny, but researches are always working out new avenues to trace truths of the past. One of the pioneers of rice research in India Mr.Ramiah had identified Jeypore region of Orissa as another independent center of origin of rice. Subsequent researches established that broad geographical region comprising Jharkand; Chattisgarh, Western Orissa and Jeypore tracts of Orissa satisfy the basic requirements to claim as center of origin of cultivated rice. If one can trace roots of rice cultivation why not trace roots of a civilization and its spread, asks Dr.Arivunambi, Dean of Tamil Studies in Pondicherry University. “In the Godda District of Bihar there is a village named Tamilgoda. In that District alone there are 12 place names, which end goda Tamilgoda is one of them. In the Puri District of Orissa a place name called Tamilikudi draws our immediate attention. There is no need to establish the Dravidian etymology of the suffix kudi. Tamilikudi is not an isolate case of occurrence as there are 37 place names with kudi suffix within the administrative boundary of Orissa. “In the process of locating Tamil related place names the entire list of India was scrutinized and I found a name called Tamia in Chindwara District of Madya Pradesh. Having come across Tamilgoda and Tamilkudi is not surprising to me. However when this name was noticed in the surprising company of such typical Tamil place names Palani, Tekadi, Theni, Bodi and many other geographical names that are in currency in the Madurai region of Tamilnadu and its adjoining upcountry neighbor Idukki, its significance and implications could be understood,” says Balakrishnan. Another research paper titled “Toponymy of Konark”, by Balakrishnan traces the spread of the word Kona. 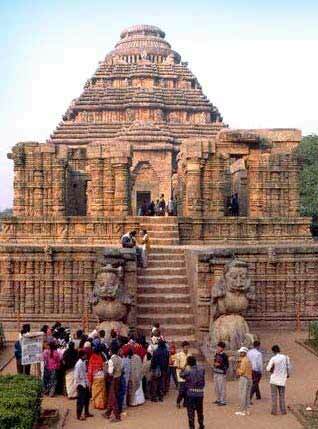 The place name of Konark is a combination of two words kona and arka. A search for Kona as a place name prefix reveals as many as 249 occurrences. Out of this Kona, a mono word place name has been used at least in 13 places [4 in Andhra Pradesh, 3 in Uttar Pradesh, 2 in Madya Pradesh one each in Orissa, Bihar, Haryana and Maharastra]. Kon seems to be a universal term. ‘The primitive tribes of Austro-Asiatic and Dravidian origin use the term as much as the speakers of Indo-Aryan do. Even the English terms such as cone, conical based on Latin conus (derived from Greek konus) show definite affinity with the term. Depending on the context, Vedic people used a number of terms to denote angle and most common of them is Karna. The term Karna means Sun, the son of Kunti by Surya and hence the sun nexus of the term would be obvious. Karna denoting ray or beam of light is considered to be the basis for the Greek term Karneios that means radiant. This establishes the nexus between the angle and ray. The Peruvian prefix Kon means Sun and the mythical Sun king who claimed direct descent from Sun is called Kon-Tiki. So goes on Balakrishnan identifying in Iran on the Gulf of Oman just 3 km away from main coastline a village called Konark. About 5 kms away from Persian Gulf he traces another village Konark. Again in the plateau of Iran he finds Konark. The toponymical probe is a new way to establish oneness of the human race. Deveneya Paavanar and his successor R.Madhivanan have used etymological probes to prove that all languages emanated from one common language. As all continents were once united in Pangea that in Latin means All Earth, the distribution of place names across continents in another way proves continental drift and the migration of human race from one place to another. Pondicherry is a place, which attracts peoples of various cultures and from Pondicherry a bright student, went to Wales for higher studies in law. He came back deeply impressed by the Welsh culture. Everyone thinks that English is spoken all over England, yet there remains Wales, where people are proud of their regional culture. Cardiff is the capitol of Wales since 1955 and a place of government from 1999 with the opening of the devolved Welsh assembly government. It has a population of 3,25,000. and out of this 5% speak Welsh one of the oldest languages in Europe. Cardiff University where the Pondicherrian Michael.M.Antony went to study his LL.M has given due place to welsh tongue too, thus bilingual publications are common sight there. And Cardiff University is a place that promotes research. 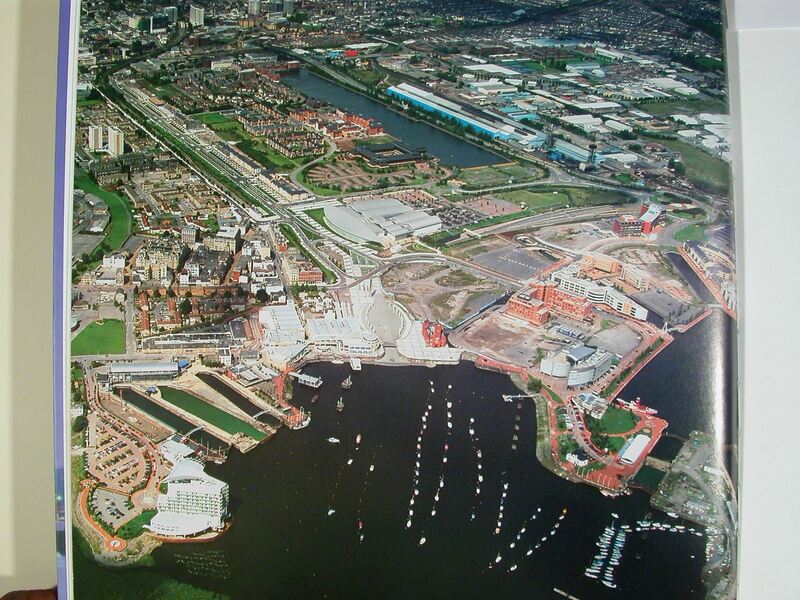 Among the 106 universities and colleges of United Kingdom, Cardiff was placed 7 th by a study. To protect its regional culture the Museum of Welsh life was opened on 7 th July 1948. It is one of the Europe’s foremost open-air museums. The last 500-year history of Wales is depicted in all its facets at the St.Fagans Castle, a 16 th century fort. 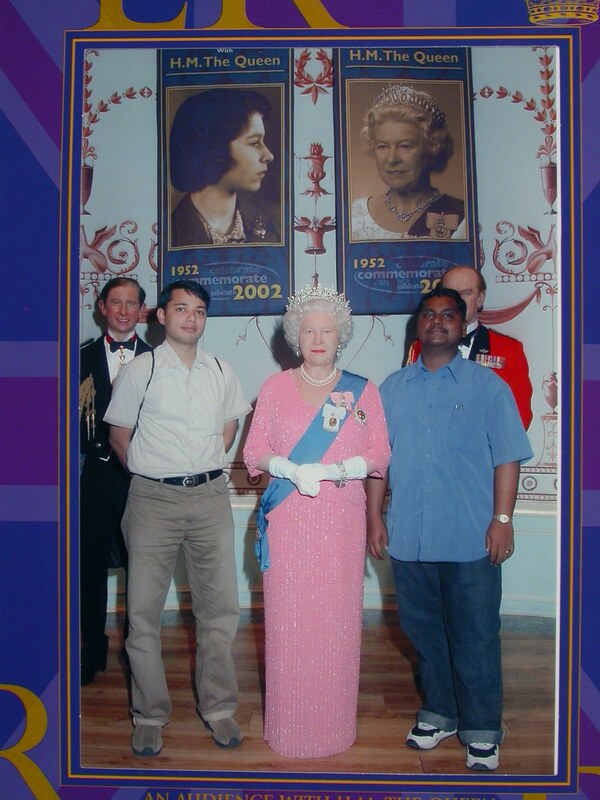 The statues of wax will make us believe that we are in the presence of the Late Personalities, as could be seen in pictures where Antony will be with Queen Elizabeth, Princess Diana and Mahatma Gandhi. “This museum teaches us on how our Arikamedu museum in Pondicherry should be constructed to be a living demonstration of the bygone centuries. As you all know people who have read about Arikamedu and its archaeological excavations of a hoary past go disillusioned after their visit to that site, since a damaged building and some shrubs and bushes alone remain to be seen. The model of National museum of Wales if emulated and an open air museum is set up it will promote our tourism,” opines M.M.Antony. The present government has acquired land to set up a site museum. The dynamic Minister for Tourism of Government of Pondicherry K.Lakshminarayanan is determined to make Arikamedu Museum a memorable experience for tourists who throng to Pondicherry. And in this hour comes this suggestion from a student of Pondicherry. M.M.Antony during his studies at Cardiff University brought out a beautiful book titled “ Environmental Liability: The stretch of company directors accountability in the United Kingdom”. He became interested in the subject inspired by the words of a British Minister.“ It is not acceptable for a company to make highly priced goods for highly paid consumers in the developed world by ruining the health of the children in the sweatshops of the developing world. It is not acceptable for a company to make beautiful furniture for the homes of rich families in the west but leave a devastated forest landscape in Brazil” said then Minister for Corporate Social Responsibility and Member of Parliament Douglas Alexander. Since India is facing lot of environmental problems M.M.Antony applied his mind on researching in environmental law. His forays into the subject made him analyze the impact of European Community’s environmental laws and that of the USA and UK. With such rich experience gained at Cardiff University, he could have opted for a good job overseas, yet he chose to be in India. As only son born after 16 years of wed lock he is even now mummy’s child deeply attached to his mother Mercy and a possessive father K.M.S.Devadasan eager to groom his son in his mould as a fire brand journalist editing the only bi lingual weekly of Pondicherry appearing since 1966. The British people who once claimed that sun never sets in their kingdom have seen that their glory never faces dusk. The way followed by those who ruled India once must awaken our spirits to preserve our past as they do. London founded by Romans in 43 A.D had been the home of monarchs and governments since 1066. Of many places of tourist interest in London the Westminster Abbey is where for nearly 900 years every King or Queen of England had been crowned and many monarchs are buried there. Britain for centuries was a sea power and in Greenwich, which is 8 kilometers downstream from London Bridge, there is a National Maritime Museum wherein history and relics of the 500-year maritime history is kept preserved. Indians were early sea- farers and centuries before others they navigated around the globe. Yet in India we never preserve our maritime records and history. In fact at 12 major ports at least our country must have maritime museums. Greenwich is famous for being the time-keeper of the globe. The prime meridian of zero longitude, the imaginary line which links the north and south poles was fixed at Greenwich in 1844 and is marked by a plate on the path. A visitor can claim to be straddling the two halves of the globe by placing a foot on either side of the line. We know laksman reka but we are not aware of Greenwich reka. The White Tower of London built by William the Conqueror (1066-1087) has served as royal palace, fortress, prison and place of execution. It also houses the world famous British crown jewels. The Imperial State Crown made for the coronation of George VI in 1937 was altered for Queen Elizabeth II in 1953. It is set with 2868 diamonds, 17 sapphires, 11 emeralds, 5 rubies and 273 pearls. The famous Koh-i-noor diamond from India adorns the British crown. The tower bridge is a miracle of hydraulic engineering. Sir Horace Jones designed it along with Sir John Wolfe Barry. The 1000 tonne drawbridges are raised to allow tall ships to pass between its twin gothic style towers. The construction started in 1886 and completed in 1894 at a cost of 800,000 pounds. The towers are connected by a 142 feet walkway. Such landmarks are necessary to make any Indian town or city as exciting as London. The River Thames of London stands in contrast with River Coovum of Chennai as extreme poles, the former with its scenic beauty and latter with its stinking nasty. The name London itself was derived from a Celtic word Llyn-din which means river place. In India we call rivers holy yet we fail to keep them clean. Civilizations grew in riverbanks all over the world. We have our Indus valley civilization with sanitation and planned cities 2000 years ago. Yet now if we look at our cities and its garbage mountains, we have to think to stem the rot before it is too late. The lessons from a London walk are many. The 18 th century Prime Minister William Pitt described the capitals parks as lungs of London. Saint James Park, Green Park, Hyde Park, Regents Park, Battersea Park, Greenwich Park are some of the lungs that purify the air of London but also remain everlasting attraction to tourists. With much fanfare about tourism promotion except in Delhi and Bangalore we cannot boast of Parks and Chennai remains pathetic in this regard. The amusement parks at east coast road may have tried to attract tourists, but what about corporation parks and spaces left for parks for various colonies, one must ponder over. The exciting London visit must educate our planners to make our cities as excitable, otherwise we will not become one among the developed world. The new Pope blesses the people. All eyes are on his blessing hand. The people see a golden ring, which carries the picture of fishermen spreading his net to catch. This is one of the two symbols of papacy. To the tsunami struck fishermen, this symbol reminds that all Popes care for fishermen. But it draws a biblical reference too. Once while Jesus was standing beside the lake of Gen-nes-‘a-ret, he saw two boats and fishermen washing their nets because they did not get good catches on that day. Jesus gets into the boat and tells to Simon “ Put out into the deep water and let down your nets for a catch”. He obeys and nets good catch, may be by divine blessing. But this biblical story also stresses the scientific invention of good catches in deep waters. Simon, the fishermen became the first disciple of Jesus assuming the name Saint Peter. In remembrance of that it is customary to give a fishermen ring to the new Pope. A pallium made out of white wool would also be presented to the newly chosen. That symbolizes the shepherd’s treading the footsteps of Jesus, who is also known as Good Shepherd. When Joseph Ratzinger, a 78-year-old German is chosen to lead the 1.1 billion-member Church these two gifts symbolizes the early composition of the followers of Christianity. The new Pope is aware of the challenges in the developing world to declining religious faith in the West. “ So many currents, ideologies and different ways of thinking” had shaken the faith of many Christians and the Catholic Church faced an uncertain future threatened by the rise of Christian sects around the world, Ratzinger said in a homily. "Having a clear faith according to the creed of the Church is often labeled as fundamentalism," he said, adding that the Church had to reject "a dictatorship of relativism" that denied the existence of absolute truths. "An adult faith is not one that follows tides of trends and the latest novelties. To be adult and mature the faith must be deeply rooted in friendship with Christ," he said. If we go back to the pages of the past, the first person to study the conditions of the origins of Christianity was Frederick Engels. He pointed out that the “most important condition was the formation of the Roman empire. The creation of a world monarchy paved the way for a leveling cult. The Roman conquest brought with it the defeat of the individual states. Its despotic and violent regime, oppression of the provinces, high taxes and general absence of civil rights led to apathy and demoralization among the broad masses, not only the slaves, but also the free population”. It was the background that remained conducive for the inception of a global religion. Old religions were tribal and national, hence could not go beyond limited boundaries. To fulfill this vacuum, the rulers of Roman Empire made some attempts to create a world religion. Roman government attempted to create the cult of the emperor’s genius, cult of the guardian of the city of Rome namely goddess Roma, and the cult of Jupiter Capitolius. All these failed. A religion of the slaves and oppressed based on the arrival of a redeemer from their sufferings emerged as many sects. In the Koran the followers of Jesus Christ are constantly referred to as Nazarenes. That was probably the original name given to the sect of Jesus’s followers. Most often his followers called themselves simply believers, brethren etc, In the beginning only their opponents referred to them as Christians. Now that global religion faces challenges, which the new Pope underlines as splitting into many sects, as in the beginning. The father of Christianity, a Jewish philosopher Philo of Alexandria believed that there was a holy mediator between the God and the material world, the Divine Logos (Word). This was common idea in Greek idealist philosophy. The divine Logos, Son of God, became the central figure in Christianity namely Jesus Christ, says Fredrick Engels. In Hindu religion, the word “OM” resembles the divine logos and the son of Shiva called Muruga, fits into the Greek concept. These similarities strengthen the truth that all religions have universal concepts and beliefs. But Pope must be perturbed over the religious intolerance that has brought terrorism to the forefront. The twin towers of America brought down by fundamentalists is the warning signal that cannot be ignored anymore. Clash of religions, cultures ignited by Osama Bin Ladens and men of his ilk, is unnecessary, unwarranted and rests on imaginary and false foundations. All religions emerged to unite people, to offer solace to the oppressed and to bring love and Peace on earth. Standing at the cross roads of history, the new Pope outlines his duties in the first words spoken, which admits the challenges ahead. In Pope, people hope, movements to global peace and equanimity eschewing enmity among fellow human beings will find support and leadership. The wind of globalization is introducing new concepts like air-conditioned vegetable and fish markets by private parties providing jobs to entrepreneurial youth. At the same time we have Pondicherry’s over crowded Main market, a place you have to plough your way in a stream of sweat and foul smell. Ever increasing garbage accumulation poses problems for municipal sanitary workers who toil tirelessly to keep market surroundings clean. The lorries that bring the daily requirements for market and small vehicles that bring fish struggle to catch space with consumers who in a haste to park as they please in the entrances of the market. This is a scene of chaos with increase in population. In Pondicherry region we have fish markets in Pondicherry, Muthialpet, Ariyankuppam, Nellithoppu, Madukarai and Villiyanur and temporary markets have sprung up in roadsides at many sub urban places. Nowadays people are looking for hygiene in every aspect of life and consumer awareness is at its peak. Further the perishable products must be sold in haste thereby fish vendors loose their revenue. The setting up of cost price shops by private parties and cooperative institutions too jumping into that bandwagon not to be left behind is a telling tale of our times. Vegetable stalls that offer fresh vegetables in air-conditioned surroundings have cropped up. Chickens and Mutton are sold in shops making it easy for people to buy at various places. But in spite of all this the fish market, vegetable market, flower market and small shops that sell from provisions to brooms are within a limited space of the main market restricted by various constraints making it impossible to expand. In such scenario a new Air Conditioned Fish for You shop set by an enterprising young educated youth K.Ponnambalam of Vanarapet, that has come up at the beginning of the Mahatma Gandhi Road near Railway station is refreshing experiment breaking from past. A student from nearby Veerampattinam fisher-men village of Pondicherry, P.Saravanane who is the 4 th son of a traditional fisherman, doing his second year in doctorate in fish pathology at the Stirling University of Scotland U.K having completed his M.FSc. (Master of Fisheries Science) at Central Marine Fisheries Research Institute Cochin on his visit to his home felt that fish markets here must be improved to make it places of hygiene in order to attract better prices for fish apart from consumer convenience and comfort of buying in a cleaner environment. To wash sands and filth in the fish catches that comes to market, P.Saravanane suggests setting up of a one-ton capacity of filtering steel tank at the entrance of the market. Immediately after washing fresh icing must be done for the preservation. The fish market should be completely closed and centrally air conditioned for maintaining low temperature, which can reduce the quick spoilage of fish. Hygienic and decent dressing for the fish vendors encouraged. Separate cabins with a washable fish-displaying table should be constructed for selling the fish and be provided with a clear drainage channel, which eventually leads to a common drainage canal. Display table must have fiberglass doors so that fishes can be displayed on an ice layer in the glass cabinet. Each cabin must be given separate pipe connections for easy and quick washing of cabin before and after selling. A hygienic and eco-friendly bag for packing the fish be introduced. There should be a high capacity and quality flake ice machine inside the market for preserving the fish and also for the display unit. Definite control measures should be taken for fly and other insects. Its also wise to have a cold storage room with two different temperature like 4°c and -20°c with clear racks and boxes for short time and long time storage of fish respectively. The market should also be provided with two doors each one for entry and exit. A separate fish cleaning room should be constructed with same facility like fish selling area with a washable table with the provision of tap water pipe connection for each fish dresser. Use of clean stainless steel knife and other fish cutting instruments be encouraged. There should be an exit in the fish dressing room so that the customers can directly exit the market, says P.Saravanane who wants to see his hometown and its markets improve to reach the western standards at least stage by stage. Fish lovers are braving all ordeals in fish markets to buy their choice and scared housewives wait for street vendors to bring fish to their doors. Let us make their life not only less miserable but make it pleasant to both sellers and buyers. Let Fish woman who carry head-loads of fish and are frowned upon regain their self respect and dignity in pursuing their marketing with changing needs of our times. Fish is wealth and not filth that comes to markets. Let planners plan ultra modern fish markets, while private stalls come up every where to cater the needs of growing population conscious of cleaner environment.